Roku has gone from a barely known streaming media box manufacturer to a retail darling in a remarkably short amount of time (the last hardware revamp launched less than a year ago) and it's back with more new hardware to continue the assault. The Roku 2 lineup will put their (much smaller) footprint in the spaces left by their predecessors when they hit shelves later this month without changing the price one bit. Besides being more energy efficient, it brings new channels including Angry Birds, Epix, MLS and more, while also upgrading the Netflix experience with support for subtitles, surround sound and 1080p video. The pricing tiers of $60 (HD), $80 (XD) and $100 (XS) remain; while stepping up to the XD adds 1080p video output, splurging for the XS adds a game remote (a $29 accessory), included copy of Angry Birds plus Ethernet and USB ports. If you still need confirmation after all the leaks, there's another pic and a press release after the break, plus a quick demonstration of the box by the cutest product spokesperson of all time. Saratoga, Calif. – July 20, 2011 – Setting a new standard in streaming entertainment, Roku today introduced Roku 2, a new family of streaming players. 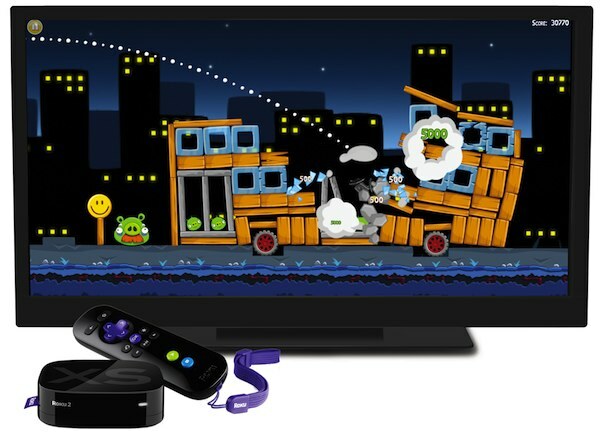 Available in three models – the Roku 2 HD, Roku 2 XD and Roku 2 XS – this new line brings popular casual games including Angry Birds to the TV alongside Roku's large and growing selection of entertainment. Roku 2 players also feature a sleek new design that's more energy-efficient than before, using less than two watts of power. "Roku is the best-selling streaming player on the market because of its simplicity, breadth of content and value. Now we're setting the bar even higher with Roku 2 – a more powerful platform with new features including casual gaming," said Roku Founder and CEO Anthony Wood. "We've worked closely with Rovio to bring the first full version of Angry Birds to the TV – and best of all, we're including it for free with the top-of-the-line XS model." New channels launching with Roku 2 include Angry Birds (full version), Facebook, EPIX, Major League Soccer, AOL HD, and FOXNews.com. Additional games will be available shortly after launch including Angry Birds Rio and Angry Birds Seasons. The Roku 2 platform offers nearly 300 channels of streaming entertainment including movies and TV shows from Netflix, Hulu Plus, Amazon Instant Video and Crackle; live and on-demand sports from NBA Game Time, NHL GameCenter Live and Ultimate Fighting Championship; music from Pandora, MOG, Rdio and TuneIn Radio; photos and videos from Flickr and Vimeo; plus news and entertainment from around the world. The Roku 2 HD, the Roku 2 XD and the Roku 2 XS are expected to be available by the end of July for suggested retail prices of $59.99, $79.99 and $99.99 respectively. Retailers include Roku.com, Amazon.com, Best Buy, Fry's Electronics and RadioShack. Since all Roku 2 players support casual games, customers will be able to purchase the game remote with motion control for use with the Roku 2 HD and Roku 2 XD players. The Roku Game Remote will be available in the coming weeks as part of a bundle that includes a 2GB MicroSD card for a suggested retail price of $29.99 at Roku.com.